And if you have any misgivings about Kaepernick’s protest (i.e., you’ve allowed yourself to believe he’s protesting the national anthem, or that he’s disrespecting our veterans, or that he’s unpatriotic), let me shout it out once more for everyone in the back row: Kaepernick is not protesting the national anthem. He is protesting police brutality that disproportionately affects people of color. His love-of-country is visible in his actions, only someone committed to the progress of this great nation would risk his reputation to stand up (or kneel) for what he believes in. Ready for a hard-pivot? Here’s a recipe! Look, I may not support the NFL in any fashion, but I do love some game-day food. 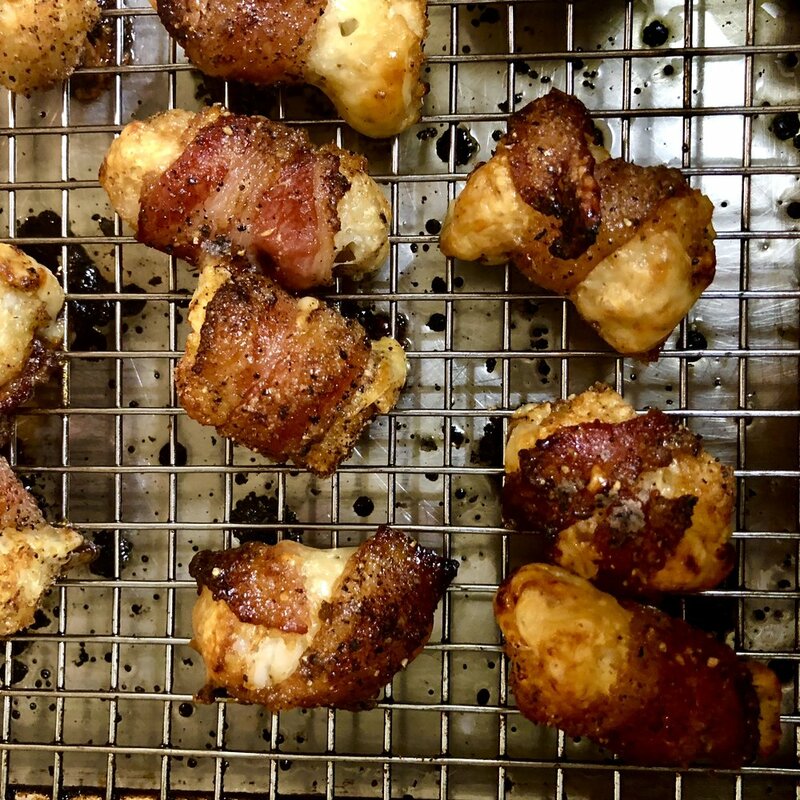 And I don’t need a football game on in the background to enjoy a crispy, chewy, salty, sweet, flavor-bomb like these bacon-wrapped cheesy tots. So turn on your favorite non-NFL game this weekend, make a giant batch of these tots, and relax on the couch. I’ll be doing the same. Heat oven to 400˚. Line a baking sheet with parchment paper. Mix brown sugar with black pepper and chili powder. Hold one cheese baton to one tater tot, and wrap the two together with bacon. Roll wrapped-tot in sugar/spice mixture. Place on wire rack in baking sheet. Repeat until all tots are wrapped, rolled, and ready. Bake for 20-25 minutes. Remove from oven, let cool for 5 minutes, then take off wire rack and serve.